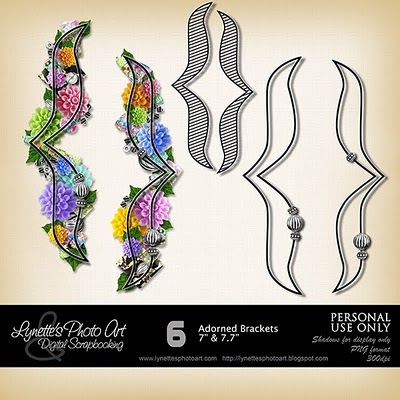 Adorned Brackets is a very special kit with 3 sets of 7-8" brackets adorned with flowers, beads and more. Today I'm giving you a sample to try the kit out. Click the image to enlarge. Click the Buy It Now Button below the picture to purchase for only $1.50 at my PayPal store. This is a 2 page layout I made using this kit and my Pop Fun kit with a couple of things credited on the preview. If you like it well enough to download, please leave me a comment at the bottom of this post as I have disabled 4shared comments. Please support this blog by shopping my PayPal store. God bless you! Thank you! This blog post will be advertised on CraftCrave in the DigiFree category today (look for timestamp: [12 Feb 01:00pm GMT]).